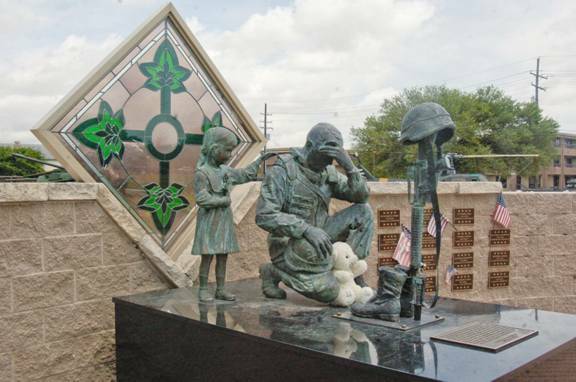 Kalat was so grateful for the America’s liberation of his country; he melted 3 of the heads of the fallen Saddam and made the statue as a memorial to the American soldiers and their fallen warriors. To the left of the kneeling soldier is a small Iraqi girl giving the soldier comfort as he mourns the loss of his comrades in arms. To be at Fort Hood, TX and be able to see the real thing is just an awesome experience. It is so real that it is an extremely moving moment. This artist really conveyed an important message of love and gratitude for our soldiers. It really touches the heart.